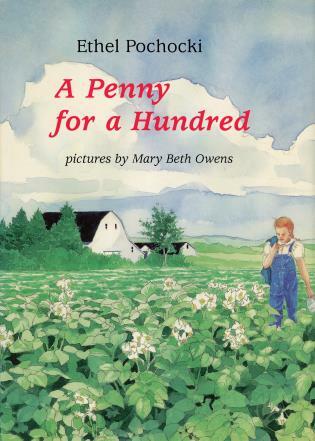 A Penny for a Hundred is beloved children's book author Ethel Pockocki's timeless tale of culture shock in rural Maine during the Second World War. It is 1944 and nine-year-old Clare will finally be able to help with the potato harvest—up until now, she was only able to earn the "penny a hundred" her father paid her to pick potato bugs off the plants. But this year, with so many local men off fighting the war, German POWs are brought in to help with the harvest. Clare's not sure what to expect from the strangers, but it soon becomes clear that these men are not so different from young American soldiers—they are relieved to be out of the fighting, but sad to be so far from home. For Christmas, Clare is determined to recreate at least one familiar tradition for Peter, a POW who has befriended her. Their gifts for one another strengthen the bonds of their friendship and help both the POWs and Clare's family enjoy a memorable Christmas Eve. Even amid the hardships of war, they find much to give each other. Award-winning author Ethel Pochocki wrote many books for children, including The Attic Mice, Rosebud and Red Flannel, and Maine Marmalade. A long-time resident of Brooks, Maine, Ms. Pochocki died in December 2010. Artist and illustrator Mary Beth Owens collaborated with Ethel Pochocki on several books. Parenting magazine selected Owens's book A Caribou Alphabet as one of the ten best picture books of 1991, and her book Prize in the Snow was awarded the 1995 Lupine Award and the Christopher Award. Ms. Ownes lives in Walpole, Maine.